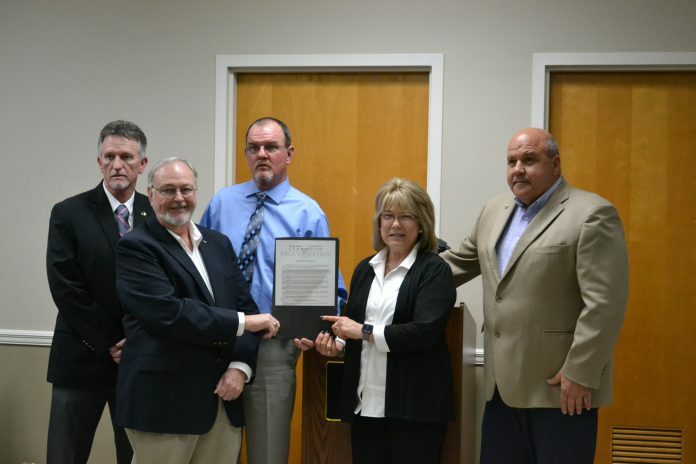 CULLMAN, Ala. – The Cullman County Commission on Tuesday proclaimed April Child Abuse Awareness and Prevention Month in Cullman County. Cullman Caring for Kids Executive Director Javon Daniel and Assistant Director Nancy Bryant were on hand to receive the proclamation at the meeting. According to the Cullman County Department of Human Resources, 974 reports of child abuse were made in 2018. Throughout the month, Cullman Caring for Kids has special events planned to help bring awareness to the signs of child abuse. One such event was approved by the commission for April 11. From noon-1 p.m. that Thursday, the public is invited to join in a prayer walk at the Cullman County Courthouse. Blue ribbons were given out and peopled were encouraged to wear them as a show of support in the efforts to recognize and stop child abuse.